Looks good, doesn't it? Rare-grilled skirt steak tumbled with broccolini, kipflers and endive and finished with a lick of mustard relish. It could be dinner, only it's not. 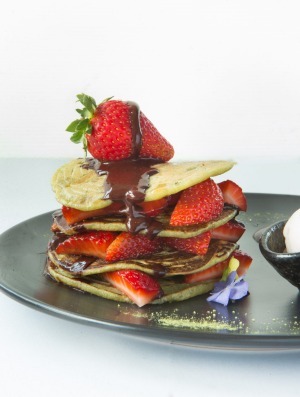 Melbourne, say hello to your new breakfast. The steak at Higher Ground is emblematic of the past year in cafe land. Breakfast has become the new dinner. We're witnessing the trickle-down effect in action as chefs with serious runs on the board turn their attentions to the most important meal of the day. 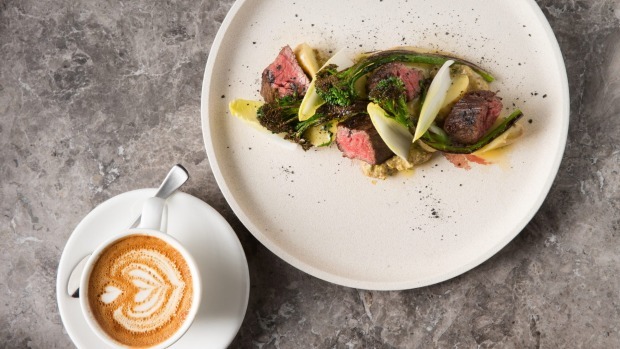 Dishes that wouldn't be out of place on a dinner carte are turning up bright-eyed and bushy-tailed, only in the company of caffe latte rather than cab sav. But what of the smashed avo, you ask? It will always have a place in our hearts but there are new pretenders knocking at the cafe door, demanding their right to chip away at honest dreams of first-home ownership. 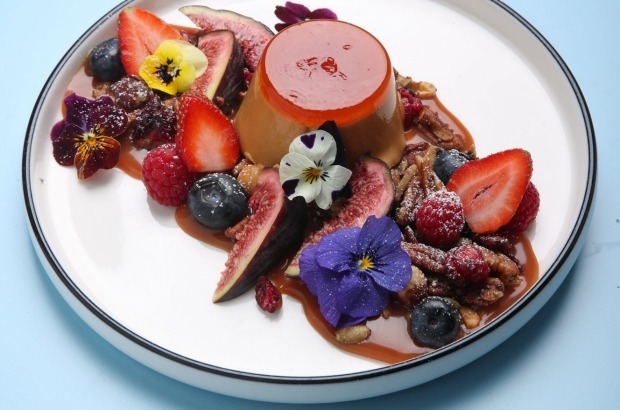 The breakfast panna cotta is itching to take the mantle. Like the smashed avo's younger, party-hard sibling, this dark side of the superfood moon is gussied up like Carmen Miranda on a big night out with gels, nuts and berries and extravagant bouquets of edible flowers. The spiced pumpkin waffle is another hot contender in lane three, while cauliflower has gone from zero to hero, its flavour-friendliness turning the most quotidian of vegetables into a headline act. Speaking of veg, dare we say: brussels sprouts. Brassicas for breakfast … whatever is the world coming to? 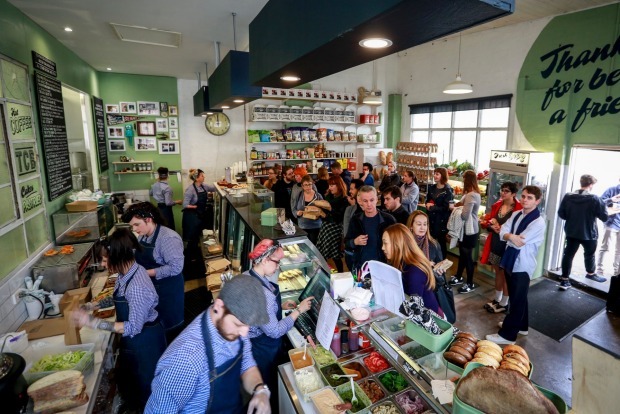 The annual Good Food cafe pulse-taking has revealed another trend worth celebrating. A severe case of cafe creep is upon us. It's democracy in action as suburbs beyond the tram line are welcoming their own purveyors of single origin coffee. Our list of the city's top 20 reveals the extent of the great migration, with punters setting their Google Maps for new frontiers formerly untroubled by the golden turmeric latte and its implications for human civilisation. From Carnegie to Templestowe and all ports in between, this year's for you. As the cafe super-group behind this Spencer Street behemoth are fond of saying, it's not quite a cafe, not quite a restaurant. The sibling of the Kettle Black and Top Paddock has turned a heritage-listed former power station into a design-accolade-winning, multi-level hotspot where a clever furnishing mix-and-match mimics a hip New York hotel lobby and the menu does its bit for the "breakfast is the new dinner" movement. Start the day with steamed barramundi on kohlrabi noodles and charred leek in mushroom dashi; end it with brussels sprouts, fried duck egg and XO sauce. Such is the topsy-turvy food world in which we live. 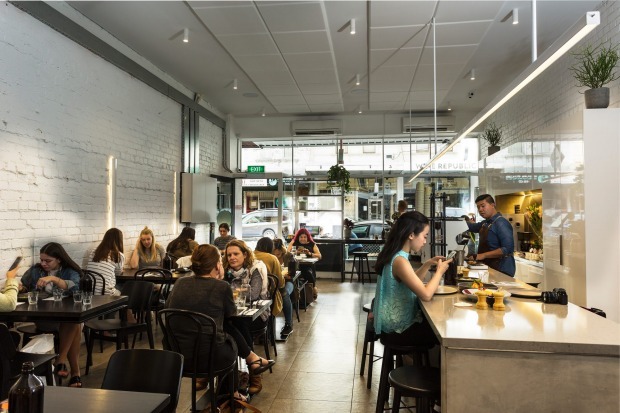 It's gone over the past nine years from Brunswick trailblazer to a solid stayer of the cafe scene, but the gloss certainly hasn't worn off this converted warehouse with room to swing a whole family of cats. Doing double time as a coffee roastery, the beans are good enough to feature on menus across town, while the breakfast/brunch menu is a masterclass in the way Melbourne likes to eat, from fish finger sandwiches to the thick-cut "proper" bacon and gruyere pancake licked with chipotle mayo almost guaranteed to put hair on your chest. Shannon Martinez and Mo Wyse, they of the multi-hued tonsorial statements and animal-loving ways, converted half of Melbourne to veganism with Smith & Daughters, then doubled down with the vegan New York-style deli we never knew we needed. 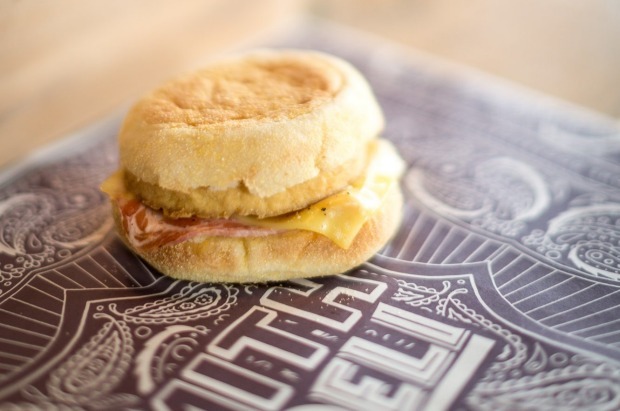 But boy, how we do need the "egg McMartinez", which gives a certain multinational behemoth an ethical run for its money, and the buttery-without-using-butter flaky croissants. 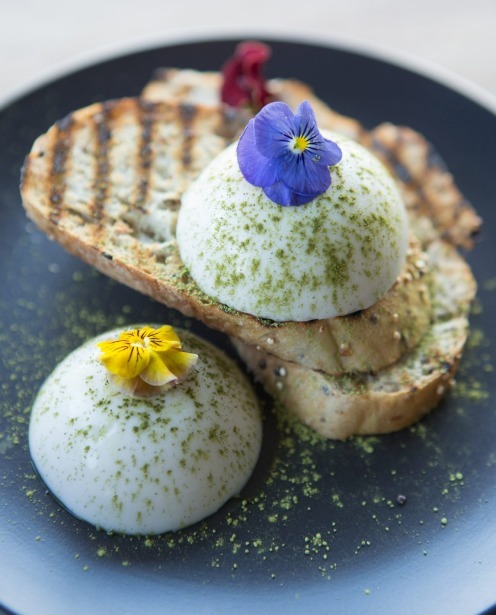 The glass case, home to things like buffalo mozzarella that (spoiler alert) isn't really buffalo mozzarella, is a vegan's fever dream, while standing in line is a bit like Tinder for the V-crowd. Vive la revolution. 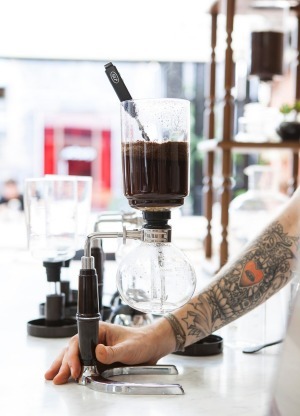 Could this be the Holy Grail of coffee in Melbourne? 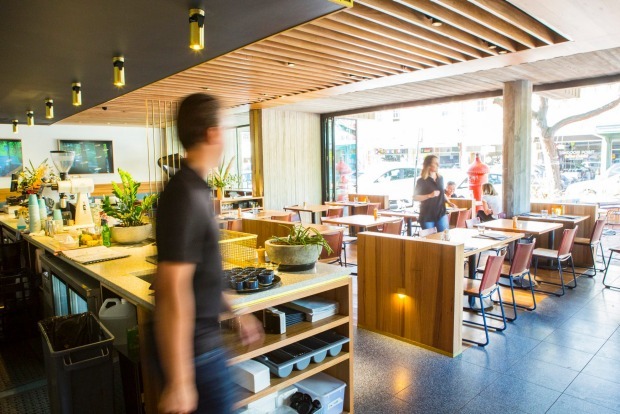 Mark Dundon is certainly the bean's high priest, husbanding the local coffee scene through its third-wave infancy at venues such as Ray and St Ali. 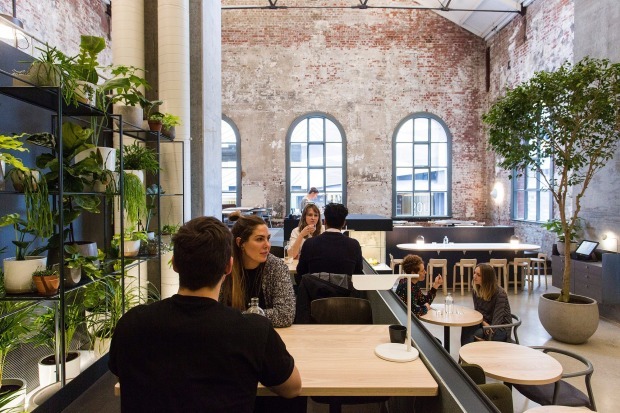 The motherlode is now located in a smartly converted warehouse in backstreet Carlton where students and suits fight for tables and even the beef brisket gets a coffee marinade. We're also confident asserting that it's every Melburnian's civic duty to attend one of the cupping sessions held each Wednesday (entry is by $4 donation to charity, and make sure you book ahead). Opened way back in the mists of time – or at least 2005 – this cafe and roastery tucked down a pleasingly obscure South Melbourne laneway kept its cred during an early change of ownership and new head honcho Salvatore Malatesta's global expansion. 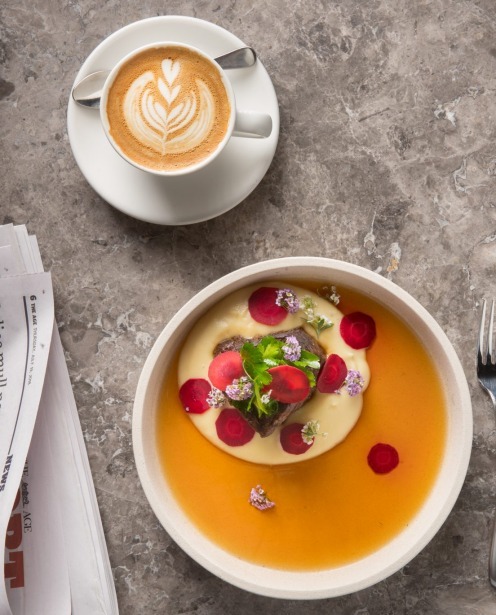 Catnip for coffee nerds, it's easy to get lost in the siphon, espresso, pour over and filter maze, but battle through to a sprightly menu that swings from pork cotoletta to vegan pancakes. You'll need a food dictionary to eat at this Carlton North corner hangout, where words like simit, pastirma and tursu dot the menu. Luckily, it's no hardship to take this trip into food that is primarily Turkish in focus. 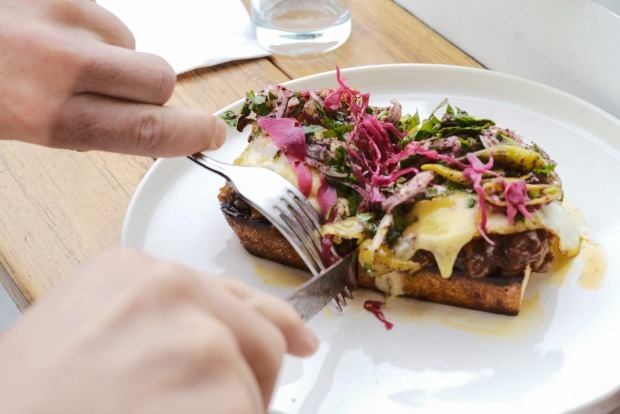 Even smashed avo takes a Middle Eastern spin with ezme (think of a piquant tomato-based condiment-slash-salad), broad beans and goat's curd with a flutter of preserved lemon, or the Aleppo-spiced eggplant cheese toastie with sumac onions. But whichever menu road you take, all lead to a warm slab of fluffy house-baked Turkish bread. It was an acid test for cafe culture when the team behind Wide Open Road turned their southern-fried den of iniquity (home of the fried chicken breakfast waffle and kangaroo jerky Bloody Marys) into the body beautiful Terror Twilight. 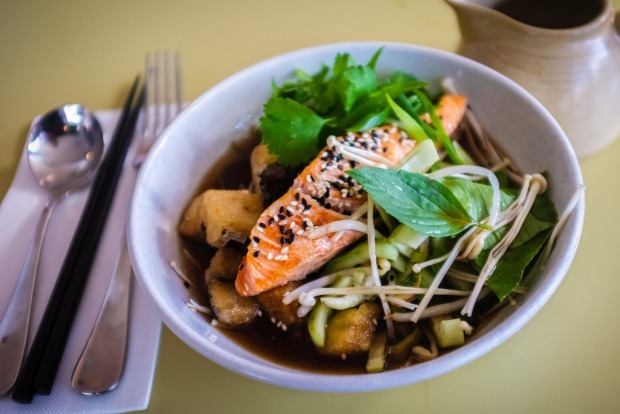 It's out with the pickled frankfurters, in with the build-our-own brown rice and broth bowls augmented by virtuous vegetable dishes of brussels sprout, zucchini and haloumi fritters and sides of kimchi. Those who like a bit of yang with the yin will be pleased to hear the Bloody Mary remains, albeit minus the roo jerky. 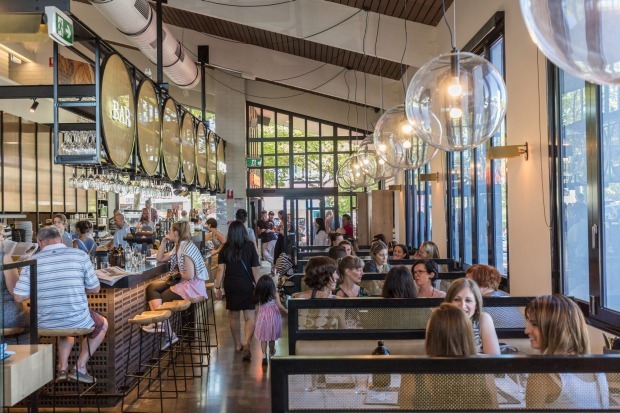 It's fair to say the group responsible for hits such as Tall Timber, Touchwood and Short Straw know fertile ground when they see it, and the cafe scene's expansionism has now colonised the south-east where Left Field attracts crowds like the Boxing Day sales. 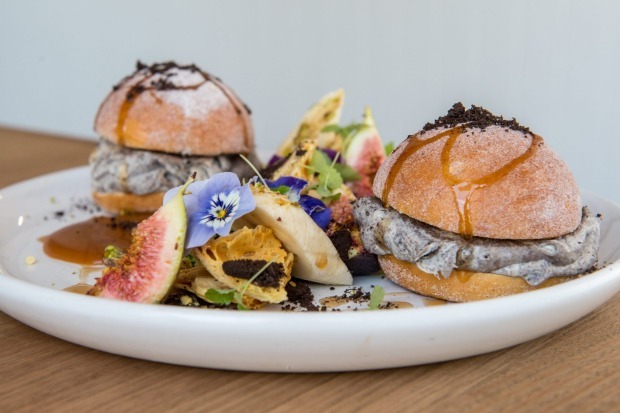 This sun-filled corner shop is no stranger to the current daytime dining fads such as pork shoulder eggs benedict and cookies-and-cream doughnut sliders with smashed Oreos, as well as turmeric lattes and chia pudding taking a walk on the wild side with honeycomb and peanut butter. It's also home to queues. Really long queues. 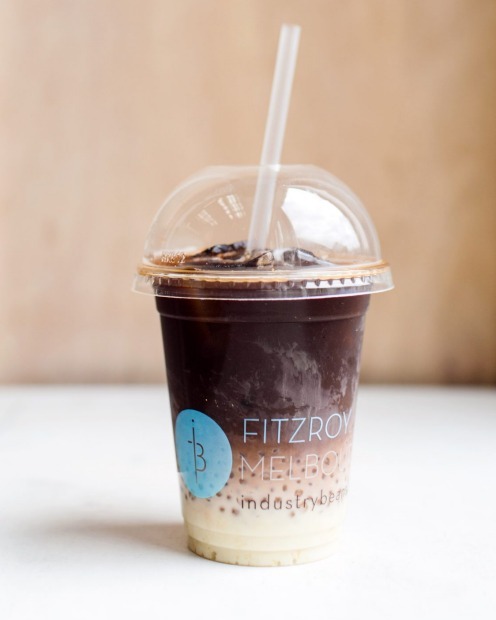 Come for the award-winning fit-out of a backstreet Fitzroy factory shell, stay for the addictively excellent brew made with beans roasted on-site. Now also in the CBD, their next-level tasting notes, complete with feel-good farmer bios, will satisfy any card-carrying coffee obsessive, but Industry Beans add a dash of levity to their single-origin sanctimony with bubble cups (made with house-made consoy (condensed milk and soy milk), cold drip and coffee-soaked tapioca pearls). Just add a shamelessly populist menu where southern fried chicken burgers rub shoulders with Asian-style beef noodle broth and a next-level house-cured salmon. 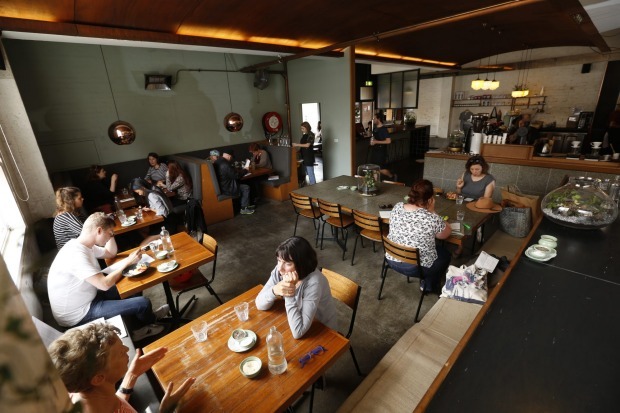 Zoe Delany and Dave Makin proved Hawthorn could be hip when they opened Axil in 2011. 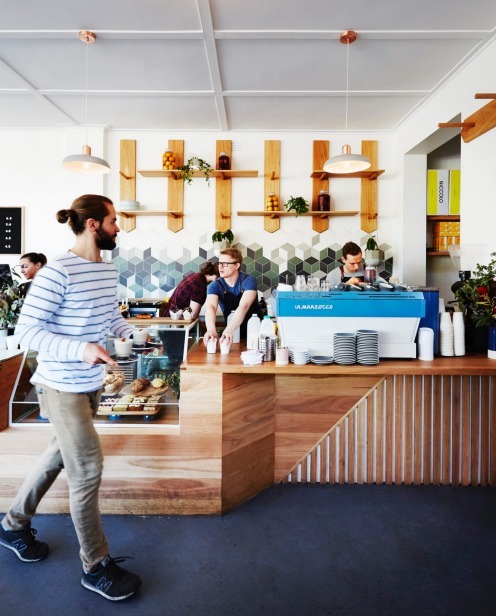 They've since gone on to cement Axil's reputation as one of the city's top specialty roasters, colonising half the cafes in Melbourne in the process with their award-winning beans as well as starting their own mini-empire. 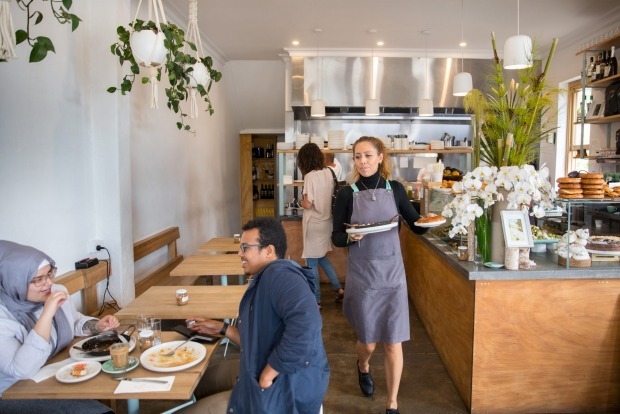 Yes, they're a busy pair of bees with an outlet even at Chaddy, but Hawthorn remains Axil HQ, home to the roastery, training and cupping room that provides punters with a free floor show, and a byword-friendly menu of smart 2018 cafe fare such as turmeric and chilli scrambled eggs with pickled eggplant, and smashed avo and Meredith goat's curd. Sometimes all it takes is one menu item to achieve cult-like status on Instagram to propel a cafe to top of the pops. In the case of Hash it's the hot chocolate. To give it its due, it's 85 per cent Mork cocoa, served in a beaker to pour over a cup topped with white fairy floss in the conical shape of Marge Simpson's hair. The inevitable sticky dissolve ticks the requisite boxes of being both a) fun; and b) delicious. As well as travelling to Camberwell, it now comes in a matcha version. The OTT French toasted bacon croissants aren't half bad, either. 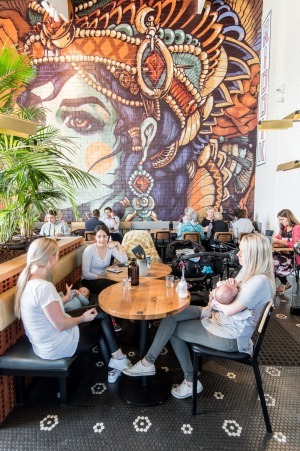 Bridge Road has been languishing in the doldrums but things are looking up with the arrival of Fifty Acres and a fit-out that invites punters to linger while discussing the capricious retail environment. 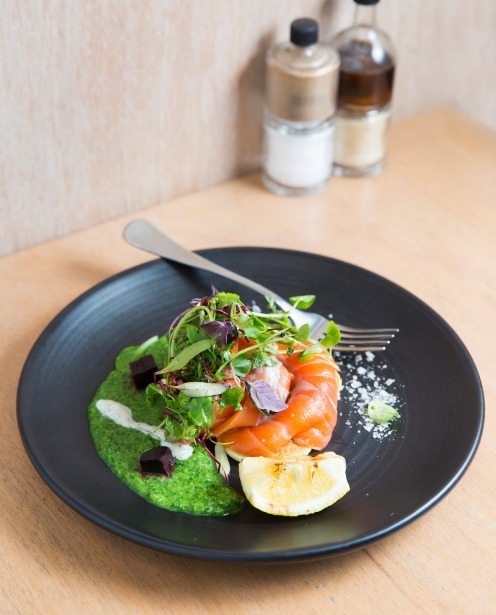 Stripped red brick and covetable metallic lights provide the French provincial antidote to the Scandi design hegemony, while the menu speaks a fluent Melbourne Esperanto, flitting from citrus-cured salmon and a poached egg on dark rye to chorizo scotch eggs. There's a breakfast board of the menu's greatest hits for the terminally indecisive, while Dukes coffee will get you fired up for the next assault on the discount fashion outlets. The Japanese have a word, "shokunin", for the pursuit of perfection in a single area and Everyday Coffee comes closest to personifying it in this coffee-lovin' town. In fact, the casual observer is left with the impression that if a cup of their house-roasted espresso, filter, pour over (you know the rest) isn't up to scratch there will be hand-wringing and despair. We love the beguiling simplicity of a place that serves a few things to eat – mostly sourdough toast and bagels – and very, very good coffee. They must be doing something right because Everyday Coffee has expanded to the city and are the Svengalis behind the fabulous All Are Welcome bakery in Northcote. A smartly converted bank + an underserviced suburb = cafe gold. That's the equation behind this Lower Templestowe joint where people dress for breakfast like there's a strong possibility they'll be hitting a nightclub afterwards. The food sticks to the theme, arriving pouting and ready for its close-up. The french toast with strawberry cheesecake is a real diva, while the cheese-oozing duck omelette is a more down-to-earth delight. Good coffee is thanks to Code Black's Ex Wife blend while the junior set swoon over the gateway drug of Oreo, Nutella, salted caramel or choc peanut butter milkshakes. 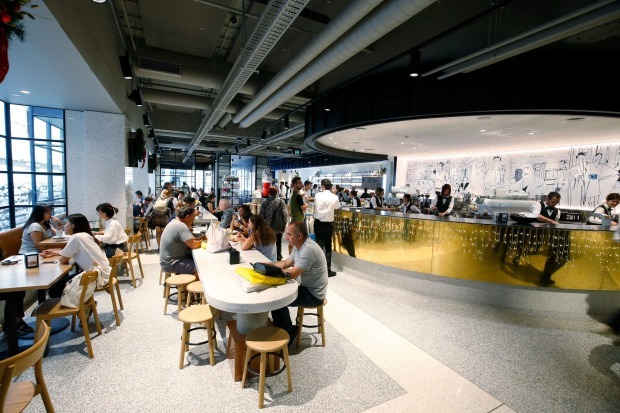 Bigger is better at Brunetti, the Carlton institution that upsized into half of Lygon Court shopping centre and has now taken on the city with a Flinders Lane address almost as big as the Colosseum. There's a surfeit of Latin pride amid the slick, glamorous surroundings. Go early for colazione completa (the big breakfast fry-up) or salmone affumicato (smoked salmon and poached eggs with avo); go late for pizze and house-made pasta. But go anytime to make like a Roman and drink your espresso at the bar. 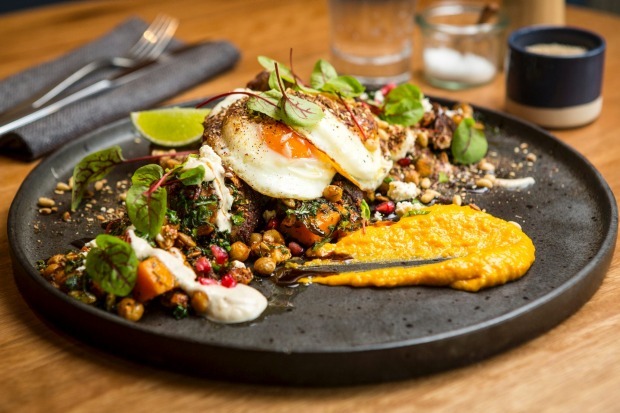 There is a conspiracy theory doing the rounds in Northcote that each new dish at Tinker needs to pass a test panel of Instagram influencers before being put on the menu. 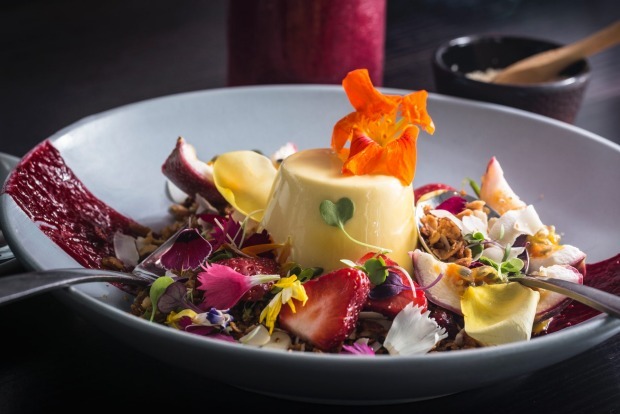 That could explain the excessive prettiness of dishes like the mango and saffron panna cotta with granola, or the smashed peas and haloumi with a beetroot labna smear popping against smoky-blue ceramics. 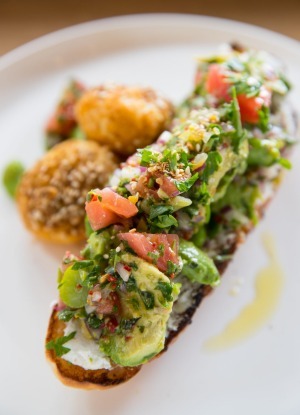 A flag-waver for the yin-yang menu – detox salads rub up against a retox burger – Tinker's beans (from co-owner Julien Moussi's Inglewood roastery) put the catholic into coffee. The fried peanut butter cookies and cream bao with banana bread, vanilla mascarpone, chocolate and popcorn crumble, banana, salted caramel and Nutella sounds more like a dare than a breakfast dish but it's the zeitgeisty excess that has cemented Plain Sailing, a sibling to Prahran's Tall Timber and Carnegie's Left Field, as the Elwood cafe du jour. Zucchini, pumpkin and herb fritters are a standout option on a menu peppered with Middle Eastern accents; ditto the dukkah-roasted cauliflower steak. And kudos to a fit-out that's vaguely nautical but nice. 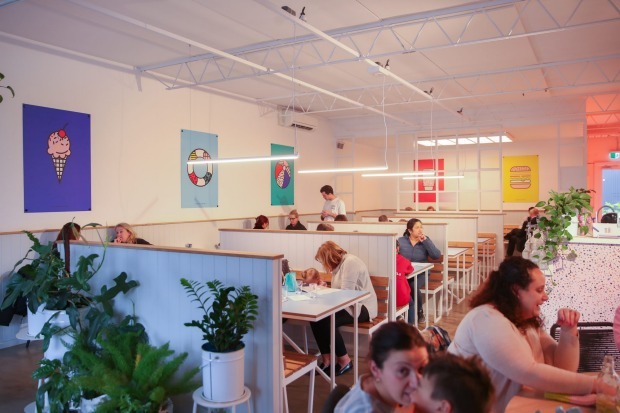 And the truth in advertising award goes to … this Bentleigh milk bar turned into a pastel-accented vision of Los Angeles. The speckled front counter and diner-style booths mix-and-match a bunch of nostalgic impulses into something that's decidedly 2018, while a menu keeps the good times rolling with things like pastrami eggs benedict on golden potato hash perked up with sauerkraut and pickled cucumber, burgers with the option of potato gems and breakfast panna cotta. In keeping with another strong cafe theme, there's a courtyard out back where the welcome mat is laid out for humans and canines alike. It's the zeitgeist, OK? 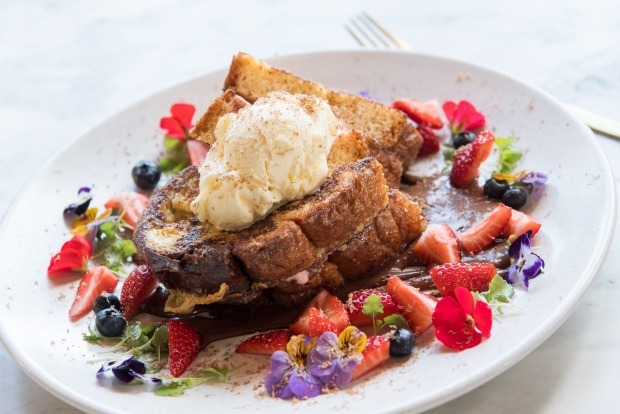 Any eye-rolling about vegans taking over the world one faux poached egg at a time might just have to get in line outside this St Kilda hotspot name-checked by a glitterati of wellness bods including Chris Hemsworth (who wants to take the concept to the US). The "eggs" get all the press but the matcha pancakes, smashed avo and breakfast bowls of virtue don't need to imitate anything to make an impression. No meat, no guilt. We can't promise you'll leave with washboard abs, though. An escape to the country less than an hour's drive from the big smoke, this platonic realisation of the self-sufficient cafe even boasts its own emus (for eggs, not meat thus far, though in the hands of Shannon Bennett anything is possible). The former piggery is all rugged atmosphere with food to match – this is the place you want to go the big cooked breakfast or hit the smoked chicken with slaw and pickles. If only they'd hurry up with the grand plan of turning the Art Deco mansion on site into a luxury hotel to achieve the ultimate stay-and-play cafe.